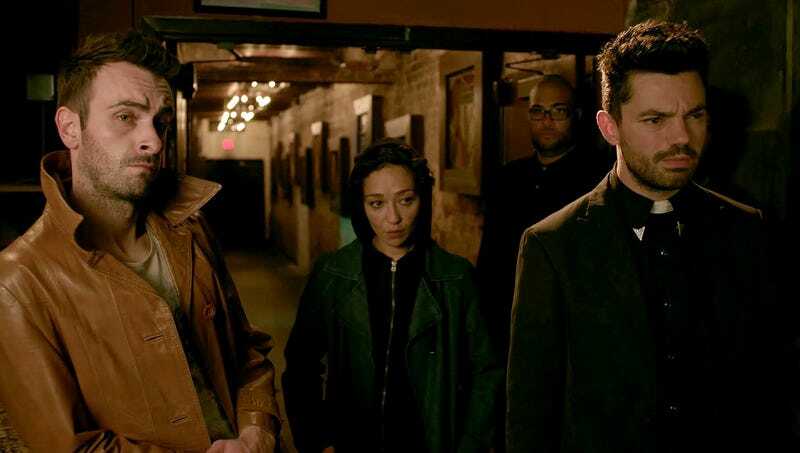 ‘Preacher’ is AMC’s hit drama about a Texas priest possessed with supernatural powers, and it provides viewers with no shortage of colorful characters of the human, angelic, demonic, and vampiric sorts. Starring Dominic Cooper as the titular preacher, the show is loosely based on a comic book series of the same name. Whether you’re caught up on the first three seasons or still need to give the show your first watch, here’s everything you need to know. 1. In order to prepare for his role as badass, take-no-prisoners priest Jesse Custer, Dominic Cooper spent months giving the after-mass announcements at his local church and always ending them with a very quick razz about how the Dallas Cowboys stink. 2. Seth Rogen and Adam Goldberg were brought onboard during the writing process to make sure that all of the demons, angels, and vampires on the show talk in the awesome, always hilarious way that real dudes talk when it’s just the bros chilling. 3. Many of the characters on the show are straight-up nasty and gross, while others are normal. 4. Following abuse allegations against Chris Hardwick, Talking Preacher will now be hosted by a trash can full of wet leaves. 5. The series is an adaptation of a truly twisted and messed up comic book series written by two guys whose minds are basically like The Joker on steroids. It’s the kind of insane, violent, seriously freaky stuff that you wouldn’t want to show your grandma—and you can trust us on that one. 6. Although many viewers assume the show is colored in sepia tones to establish a gritty aesthetic, it is actually part of a multi-season branding deal with Aunt Jemima that requires the show to be shot through syrup. 7. Preacher’s slaughterhouse owner character was originally going to be female, but was rewritten as male when the writers couldn’t figure out whether or not female slaughterhouse owners need to wear sports bras for their jobs and decided to avoid the issue entirely. 8. The show spent 20 percent of its season one budget digitally removing the wires suspending halos above the angels’ heads, and an additional 40 percent of the budget removing the halos themselves when the creators realized it wasn’t the wires that made them look dumb. 9. Fans were shocked by season two’s twist ending in which Jesse Custer reveals that he’s so sinful because he keeps forgetting to eat breakfast and has been having kind of a weird month in general.